Daughter of the Dust is a country musical comedy playing this Sunday and will be the Bread and Circus venue’s last show before it closes down. 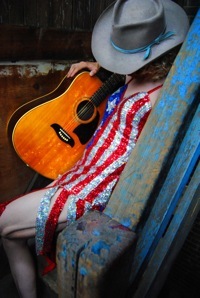 It features Robin Sharp as Trixie Dixon, a Taylor Swift-esque country singer trying to make it – if Taylor Swift were a drag queen. Also adding to the her troubles is the fact that her city-boy boyfriend Brian won’t make love to her – and her back-up guitarist Carson seems more than willing to do it instead. The venue is a private theatre room at the back of the bar lounge that seats only about 80 people. Because of its small capacity it feels very much like a Fringe Festival show – small, intimate and low budget. But the costumes, set design, makeup, music and acting – heck, everything about this play, basically – makes up for the less-than-great venue. The thing is, the fact that the stage is so small doesn’t really make a difference. Robin Sharp, who wrote all the music along with Katie Avery, has created a country musical masterpiece. The songs are intelligent, clever, hilarious, and well-composed. Unbelievably catchy, they are also very cheeky – without being cheesy. Some of my favourites included “Never Fall In Love With A Musician,” and “Just The Tip.” They range from fast-paced songs to slow, sad ballads. The cast of five all really impressed me. Robin Sharp plays a young woman so convincingly, if I had seen him on the street I wouldn’t have looked twice. Robin wears a blonde wig and is lanky enough to really look like a girl. His ability to not only act, but also sing in a feminine way caught me off guard. He is even able to make his character’s tearful breakdown look truly sweet and innocent. Claw, played by Scott Moore, is the owner of the Shindiggler who gives Trixie a chance to sing. His Southern drawl and demeanor is believable. His character, along with Brian played by Russel McLeod, offer stability to the play with their down-to-earth characters. Brian is Trixie’s shy boyfriend, who is worried about her cheating ways. His performance is calming, quirky and sweet, and adds a nice steady flow to the play. Finally, Tanya Dixon, Trixie’s mother, is played by Lynn Filusch. Her character is tempestuous and has a tendency to scream at her daughter, showcasing the very extremes a mother-daughter relationship can have. Even her character, which is loud and obnoxious, is a real dimensional character played with depth and thoughtfulness. Filusch has a powerful voice which she really uses to the play’s advantage. The musicians playing guitar and double bass are Steve Joseph and Tom McKibben, members of the professional group Slant Six. Katie Avery, who arranged the music, plays the fiddle alongside them. The musical performance and arrangement are superb. It’s not the Keith Urban nu-country – it’s a tribute to the old school country music, like Patsy Cline, Hank Williams, Dolly Parton and the like, and they seem to know their country music history well. I happen to like this classic country music, but I think anyone would enjoy the music in the play because the lyrics are so funny. This play really isn’t about the fact that the main character is in drag. It’s truly about the well-written script and music, and the music carries the plot along extremely well (unlike Glee), never slowing the story down or becoming irrelevant to the scene. The actors are genuine, sweet, and full of acting and musical talent. It borders on raunchy but never enough to make you feel uncomfortable, always staying on the cheeky side instead to keep things lighthearted and fun. I highly recommend this country musical comedy – it’ll make you laugh, that’s for sure. I do hope that this show has another run after the venue closes down on Sunday, because it deserves to be seen by a lot of people.